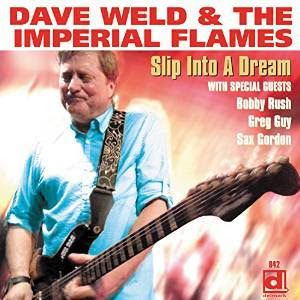 I just received the newest release, Slip Into A Dream, from Dave Weld & The Imperial Flames and it's nothing short of outrageous! Opening with title track, Slip Into A Dream, Weld leads with solid vocals and confident guitar work. Backed by Monica Myhre on vocal, Dave Kaye on bass, Jeff Taylor on drums, Graham Guest on organ and Harry Yaseen on piano, this track is slinky and pendulous. Dave doesn't wait too long to unleash the dogs and his guitar work is off the hook. Simply terrific! Sweet Rockin' Soul is a rock n' roller with Yaseen driving the train. Weld and Myhre harmonize on this track but yes... he's hammering on the guitar again. Yaseen plays a cool piano solo illiciting a hot drum response from Taylor. Cool! Lookin' For A Man features Myhre on lead vocals and Weld slips on the slide. Joined by Bobby Rush on extended harp this shuffle track lets Dave get into full slide mode...right off the fret board. Very nice! Add a little funk and some horns and you get Take Me Back. Parris Fleming (trumpet), Rajiv Hamlin (tenor sax) and Bryant Smith (trombone) really give this track that JB punch. Weld really gets it would up on this one feeding the guitar all it can take. Excellent! Boogie track, May Be Right, May Be Wrong has a real nice groove with Greg McDaniel on bass. With it's Texas guitar swagger and Graham Guest on piano, this track rips! R&B based Sweet Love (Dulce Amor), has more mellow feel with Myhre on lead and tight trumpet accents by Kenny Anderson. Nicely stylized guitar work by Weld and a super sweet solo from Hank Ford gives this pop track some real traction. Rock n' roller, Louise, has a real grinding feel with Myhre on lead vocal and Weld slides in giving it real fire. Sax Gordon steps up with hot bari and tenor sax work making this a track to be reckoned with. Shifting back to a real Texas style driver, Weld takes the lead vocal back on Tremble and the track swings a bit bat. Sax Gordon's horn work is thick and meaty and Weld never shy's away from total destruction. His guitar work is wild and feverous making this a smoking hot track. Bringing things way down, slow blues, Walk On Down, lead by Myhre on lead vocal, gives Weld to build slowly. This shows a totally different side of his playing style but still riveting. Yaseen plays a really nice piano solo on this track and Kaye's bass work is tight. Drummer Jeff Taylor penned, Dorothy Mae, features Taylor on lead vocal and some of the snappiest drumming I've heard in a while. With full horn compliment by The Heard Horns this track gets funky. Hamlin sings on sax and Weld belts out another nice guitar solo. Weld breaks down the door on the intro to Too Bad, So Sad, a driving rocker. When he cuts loose he's an absolute beast held in check by Taylor and Kaye. Swinging rocker, 20% Alcohol finds Weld back on lead vocal. He's really winding up the slide and lets it rip. Rush in back with a sweet harp solo and with Kay's walking bass line, nicely balanced. Wrapping the release is a reprise of Slip Into A Dream. This track is a crusher and Weld really applies the pressure. A monster of a guitar player, it's good to see him let the dog off of the leash again. Excellent!